Metallurgical coal is also called ‘met coal’ or ‘coking coal. It is a bituminous coal which allows the production of a coke suitable to support a blast furnace (BF) charge. It is distinguished by the strong low-density coke produced when the coal is heated in a low oxygen (O2) environment or in absence of air to reduce mineral impurities (e.g. less sulphur, phosphorus). On heating, the coal softens, and volatile components evaporate and escape through pores in the mass. On cooling, the resultant coke has swollen, becoming a larger volume. The strength and density of coke is particularly important when it is used in a BF, as the coke supports part of the ore and flux burden inside the BF. Metallurgical coal possesses the ability to soften and re-solidify into a coherent, porous mass, when heated from 300 deg C to 550 deg C in the absence of air in a confined space. The conversion from coal to coke occurs in chambers called coke ovens where the volatiles from the coal escape, leaving behind what is referred to as metallurgical coke, which reaches a temperature of around 1,000 deg C to 1200 deg C before being removed from the ovens. The coking cycle is normally dependent on several parameters. Coke is used primarily as a fuel and a reducing agent in a BF. The gross calorific value (CV) of the metallurgical coal is greater than 5700 kcal/kg on an ash?free but moist basis. It presents unique plastic properties during carbonization which in turn produces a porous solid, high in carbon (C) coke. Metallurgical coals, when heated at a moderate rate in the absence of air, undergo complex and continuous changes in chemical composition and physical character. During carbonization, most bituminous coals, except those bordering on the lignite coals and semi-anthracite coals, show evidence of softening, coalescence, swelling, fluidity, and finally hardening of the coal substance. There are marked distinctions in the degree to which each of these plastic characteristics is shown by different metallurgical coal. The suitability for conversion to coke is also referred to as the coking ability. Metallurgical coal is harder, blacker, normally has less ash, and contains less moisture. The coking ability of coal is somewhat correlated with its physical properties such as its rank, but laboratory and sometimes pilot oven testing is required to completely evaluate the coking ability of the coal. There are three types of metallurgical coal namely (i) hard coking coal (HCC), (ii) medium coking coal (MCC), and (iii) semi-soft coking coal (SSCC) or weak coking coal. Sometimes coals used for pulverized coal for injection (PCI) are also considered under the category of the metallurgical coals. HCC is a necessary input in the production of strong coke. It is evaluated based on the strength, yield of and size distribution of coke produced which is dependent on rank and plastic properties of the coal. SSCC is used in the coke blend, but results in a low coke quality with a possible increase in impurities. Coking coal, by definition, must be HCC and the term hard coking coal is a general term used to describe coking coals with superior coking properties relative to the other two types of the coking coals. Coking properties are usually rank dependent and the term semi-soft is normally applied to lower rank high VM coals. These coking properties include caking index which is modified from Roga Index, maximum thickness of plastic layers, and maximum dilatation. Metallurgical coals are usually classified as high, medium, and low volatile based on their dry, mineral matter free volatile matter (VM). High volatile coals have VM typically between 31 % and 38 %, medium volatile coals have VM between 22% and 31 %, and low volatile coals have VM between 17 % and 22 %. There is usually a strong inverse relation between vitrinite reflectance and dry ash free VM content. The amount of VM in the metallurgical coal impacts coke and by product yields which are the amounts of coke and by-products produced per ton of coal. Increased moisture content has a comparable impact on coke yield and can also impact bulk density (BD) in the coke ovens and the heat requirements in terms of kcal/kg of coal carbonized. The ash in the metallurgical coal is passed to coke and becomes an impurity in the coke and hence reduces C input in the BF. Thus, ash contributes to higher coke rates, and it reduces hot metal (HM) production due to increased slag volumes and the additional coke and limestone needed for the smelting of the ash. It also occupies volume of BF which gets used in a non-productive manner. The composition of the ash is also important since certain components of the ash, such as the alkalis (Na2O, K2O) and phosphorus pent-oxide (P2O5) content, also impact coke rate and HM quality. Ash composition has also been found to impact the values of coke reactivity and the coke strength after reaction (CSR). The composition of the ash needs to have as low a base/acid ratio as possible (normally lower than 0.2 %) with low alkalis (normally lower than 3 %) and low P2O5 content (normally less than 0.02 %). Sulphur, like ash, is required to be removed from the HM, either within or outside the BF, and like ash, contributes to higher coke rates and lower HM productivity. Bituminous coal, of which the metallurgical coal is a part, is generally comprised of three major maceral groups namely (i) vitrinite, (ii) inertinite, and (iii) liptinite. These maceral groups proceeded along distinctly different metamorphic paths. Vitrinite is the predominant maceral constituent in nearly all coals, originating from the woody tissue of plants. It is the most abundant of the macerals and matures the most uniformly throughout the coalification process. The reflectance of vitrinite in plane polarized light is frequently used as the decisive indicator of coal rank. Vitrinite is quantitatively the most important maceral, accounting for probably 60 % to 80 % of most worked coals, and it is the material primarily responsible for the characteristic coking behaviour of higher rank bituminous coals. In terms of coking properties of coals, vitrinite is predominate reactive binder forming the wall and pore structure of coke and acting as the adhesive necessary to assimilate and bond the aggregate, which originates with the inertinite group. Vitrinite reflectance (mean maximum reflectance, MMR) which is used to determine the coal rank, is measurement by the percentage of light reflected off the vitrinite maceral at 500x magnification in oil immersion. The MMR values for metallurgical coals (Fig 1) in case of low volatile coals are normally in the range of 1.42 % to 1.75 %, in case of medium volatile coals normally in the range of 1.0 5% to 1.4 %, and in case of high volatile coals normally in the range of 0.70 % to 1.02 %. Inertinite is comprised of various plant remains which achieved a high rank early in the coalification process such as fusinite and semi-fusinite which originated from woody tissue exposed to fire and converted to charcoal, or micrinite which is thought to be the product of accelerated decay of a variety of plant tissues during the inception of coal formation. Most inertinite, as the name implies, is inert. Inert does not imply that the materials undergo no chemical reaction, but only that they do not soften or swell on heating and contribute little to the VM. Liptinites were originally formed by spores, pollen, dinoflagellate cysts, leaf cuticles, and plant resins and waxes. It is also very reactive. In terms of coking properties of coals, members of the liptinite group have much lower coke yields than their associated vitrinite and contribute more heavily to the by-products during coke making (i.e., coke oven gas, tars, and light oils etc.). Liptinite matures much more slowly than its associated vitrinite in the early stages of coalification, up through high volatile with level ‘A’ bituminous in rank, and then very quickly in the medium volatile rank range where it becomes optically indistinguishable from the vitrinite. The rank and proportions of liptinite, vitrinite and inertinite do dictate the behaviour of a metallurgical coal during heating in a coke oven. But other properties of the coal also have a significant influence, as given below. The distribution of the inertinite and liptinite within vitrinite of the coal particle – a particle composed of only a pure maceral or distinctive grains of macerals will have different plastic properties (and therefore coke morphology) than a particle where the inertinite and/or liptinite is distributed throughout the vitrinite. The mineral matter can play a catalytic role which will influence the decomposition of the coal and can also influence the reactivity of the resulting coke. Mineral matter comprises of the ash and sulphur (S) found in the coal. It can be quite variable depending on its origin, and its level of concentration can impact utilization potential. The inherent ash forming minerals which contribute to a plant’s nutrients represent the more basic components in the ash, while its inherent S is of the organic variety. Ash forming minerals added later as impurities during or after the biochemical stage can be basic or acidic in nature depending on their origin. Pyritic S can also be of primary or secondary origin, originating from bacterial action or the precipitation from S bearing waters. Metallurgical coal, and the resulting coke, must have low ash and S content for it to be used in the iron and steel plants. Other important properties of metallurgical coals are described below. Metallurgical coals are to be prepared for their charging in the coke ovens. There is substantial cost attached to the coal preparation. The Hardgrove Grindability Index (HGI) is a good indicator for the expected crushing behaviour of the coal. The high HGI of a soft coal allows a crusher to be operated at a higher throughput with the same or lower power requirement. The size distribution of the coal is important since it can impact on the coal handleability in bins and in transfer conveyors. The ash fusion test (AFT) is performed in a reducing atmosphere and helps assess the combined effect the ash forming minerals have on ash softening properties at different temperature levels. Higher levels of AFT prevent ash from depositing on coke oven floors and walls or freeing up fresh C surfaces to reactive gases. The AFT value of the metallurgical coal is to be ideally greater than 1450 deg C.
The light transmittance test (LTT) has been developed to detect weathered or oxidized coal found primarily in surface mined coking coal. The presence of even small amounts of oxidized coal decreases fluidity, dilatation, coke strength, and leads to the excessive fines generation which in turn creates coal handling problems and causes decreased oven BD. Oxidized coal also contributes to reduction in the by-product yields and increase in the heating requirements during the conversion of coal to coke. Coke produced from coal charges containing oxidized coal also results into increase in the coke reactivity index (CRI) and decrease its corresponding CSR in the produced coke. Plasticity is an important property of the metallurgical coals. It refers to the melting and bonding behaviour of the coal. Its importance is because of the following. It is an indication of the initial softening, chemical reaction, gas liberation, and re-solidification process within the coke oven. It is an important requirement in the coke blend and is required for end product coke strength. The fluidity of the plastic stage is a major factor in determining what proportions of a coal is used in a proportion of a coal, is used in a blend. During the heating of coal, an unstable intermediate phase called metaplast is formed after the moisture is driven from the coal. The metaplast is responsible for the plastic behaviour of coal. On further heating a cracking process takes place in which tar is vaporized and non-aromatic groups are split off. This cracking process is accompanied by re-condensation and formation of semi-coke. When a coal/blend is heated in coke ovens, two principal layers of plastic coal are formed parallel to the oven walls. They are linked near the sole and the top of the charge by two secondary plastic layers forming an envelope of plastic coal. As carbonization proceeds, the plastic layers move progressively inward eventually meeting at the oven centre. It is within these plastic layers that the processes which result in particulate coal being converted into porous, fused semi-coke take place. The semi-coke undergoes further devolatization and contracts which results in fissures in the final coke. The only small-scale methods which have stood the test of time and have been accepted as standard plasticity tests are the crucible swelling number (CSN), Gray-King coke type, dilatation characteristics, Gieseler plasticity and, in some countries, the Rogas index and the Sapozhnikov test. All of these are essentially empirical in nature and many are subjective, at least to some degree. The Gieseler plastometer test is the only one which attempts to measure the actual extent of the plasticity of fluidity attained. The Gieseler test is used to characterize coals with regard to thermo-plasticity and is sometimes an important tool used for coal blending for commercial coke manufacture. The maximum fluidity determined by the Gieseler is very sensitive to weathering (oxidation) of the coal. Plasticity test measures the degree to which coking coals soften, swell, dilate, and later re-solidify over the temperature range from 300 deg C to 550 C when heated in the absence of air. Some plasticity tests also measure the ability of the coal to agglomerate and assimilate inert material over this same temperature range. The Gieseler plastometer test measures the fluidity or plasticity of coking coal in a cylinder with a stirrer inserted inside. The cylinder of coal is heated at a constant rate as steady torque is applied to the stirrer. As the coal heats up, it softens and the stirrer rotates. The ddpm (dial divisions per minute) is the maximum amount of revolutions the stirrer completes. 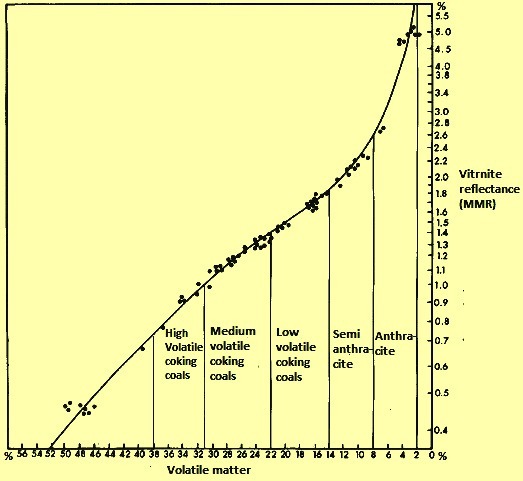 The test is logarithmic with high volatile coals showing fluidities many multiples higher than low volatile coals, with medium volatile coals generating values in between the two extremes. The values of fluidity of the metallurgical coals in ddpm in case of low volatile coals are in the range of 20 to 1000, in case of medium volatile coals are in the range of less than 200 to 20,000, and in the case of high volatile coals are 5000 to greater than 30000. Since the combined effect of the test procedure and equipment on the ddpm results can contribute to an unacceptably high reproducibility, the plastic range is a more useful indicator of coking performance and ties more closely to the dilatometer results where the reproducibility is much better. The dilatometer test measures the contraction and dilatation of a 60 mm pencil of coal in an oven of rising temperature. The dilatometer values are mainly useful since they indirectly measure the thickness and viscosity of the plastic layer, and how they are impacted by the amount and rate of gas evolution during softening and re-solidification. The normal percent dilatation (dilatometer values) for metallurgical coals in case of low volatile coals are in the range of 0 % to + 200 %, in case of medium volatile coals are in the range of + 100 % to + 250 %, and in case of high volatile coals are in the range of + 50 % to + 300 %. The Free Swelling Index (FSI) also tests the plastic properties of coal. However, its value as a rheological test is limited since it is more of a threshold test having little quantitative value. The test involves heating a gram of coal in a crucible to 800 deg C and then visually comparing the resulting coke button to a standard chart of shapes and sizes to determine the FSI value on a scale of one to nine. FSI values of HCC are in the range of 6 -9, that of MCC in the range of 2-4 and that of SSCC in the range of 1-2. Other rheological tests which are used around the world include the Gray-King test, the Roga index, the G caking index, and the Sapozhnikov plastometer. The sole-heated oven test, the pressure oven test, and the movable oven wall test are technically classified as rheological tests but are intended to measure the performance of formulated blends in terms of contraction away from the oven walls, the pressure exerted against the oven walls, and the quality of coke expected to be produced respectively. The quality of the metallurgical coal is determined in terms of chemical elements, ash content, moisture, caking properties, and strength. The most important chemical elements of the metallurgical coal consist of S, phosphorus (P), and alkalis (Na, K). Parameters used to evaluate caking properties can be classified in three major characteristics namely (i) parameters describing quantity and quality of liquid matter during the process of coking, including maximum plastic layer thickness, maximum fluidity, and maximum dilatation, (ii) parameters focusing on coke profiles and geometry, such as FSI (free swelling index), Grey-King index, CSN, and (iii) parameters regarding the coal caking ability to combine inertinite matter. Blends of the metallurgical coals are generally formulated from a variety of different ranks, types and grades of coals sourced from different sources with the purpose of producing the highest quality coke at the lowest possible cost while protecting the ovens in which those blends are being carbonized.